When it comes to cars, we Brits love our Fords. The brand has been a regular at the top of the sales charts for decades with the Fiesta and Focus selling by the bucket load. But since its launch in 2014, the little-yet-large EcoSport hasn’t been the runaway success you might expect from a pint-sized Ford. 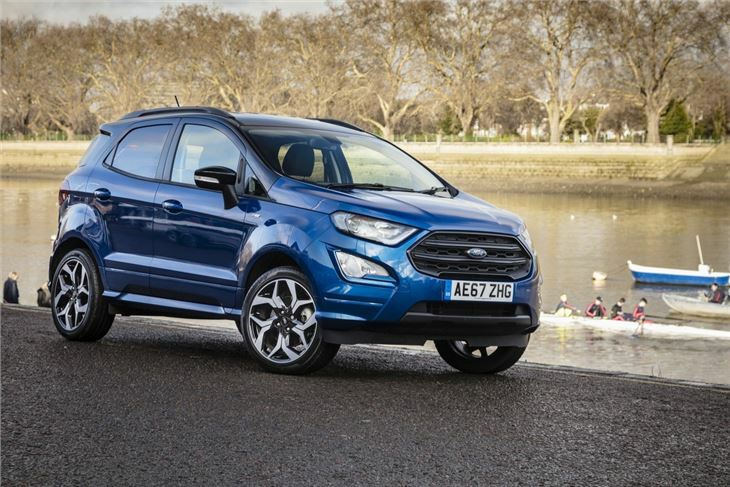 Engineered as one car for a global market, the EcoSport been popular in Brazil, but less so in the UK. Partly due to the fact that Ford already had the B-MAX competing for the same market. But also because the EcoSport just wasn’t very good. It was noisy, felt a bit cheap and had a spare wheel on a swing boot door (which opened the wrong way for right-hand drive). The car also lacked the fun factor of other small Fords. In short it just wasn’t very… Fordy. 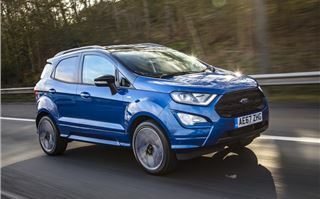 But as drivers continue to desert traditional cars in favour of crossovers (think tall, rugged styling but still two-wheel drive) and B-MAX production ends, Ford has given the EcoSport a much-welcome reworking. 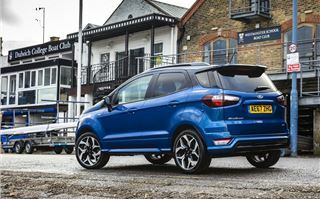 But there’s a price to pay (about £2000) as the entry-level Zetec now costs £17,495. At the top end there’s a new model but also an increase of about £1000 to £20,295. So, what’s new? Well, for a start Ford is now building EcoSports in Europe (at Craiova in Romania if you’re doing a pub quiz). The car has also been given a facelift. Gone is the messy, ‘designed by committee’ look of the original model, replaced instead by a smart looking small SUV, albeit one with odd proportions. But at least it actually looks like a Ford now. You can personalise it, too, with a contrasting roof, window pillar and door mirror colours (although there aren’t enough beige-based colour options to make that work for us). If you’re are about the horses (or PS as we call them now) then the Mustang review is here (and yes, unsurprisingly, Ford did sell more V8s than EcoBoosts). 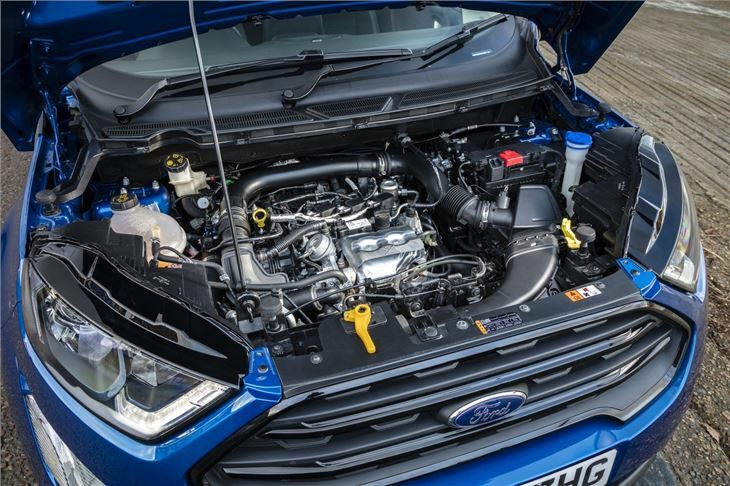 If for some reason you still want to know about the EcoSport’s powertrains then shut the front door because – and you won’t believe this - there’s a new diesel engine. Yep, with all the controversy of ‘dieselgate’, Ford is bringing out a new, cleaner diesel. Just so there can be no confusion, it’s called EcoBlue and it’s a 1.5-litre TDCi 125PS unit. Whether anyone will buy it remains to be seen. This engine joins the line-up alongside previous offerings. In case you haven’t done your homework, that’s a 1.0-litre EcoBoost petrol (available as either a 125PS or 140P) or a 1.5-litre 100PS diesel. Both take between 12 and 14 seconds to get to 62mph, and return between 52mpg and 65mpg. 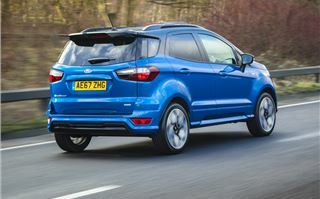 To use common road test parlance, Ford is also promising to ‘mate’ this latest ‘lump’ to an intelligent all-wheel drive system in the spring to create some kind of ‘go anywhere’ EcoSport monster (although it will have a tough job on its hands if it wants to beat the Suzuki Jimny). Clever tech means you’ll be able to select from various driving conditions, although we understand that you won’t be able to manually select full-time drive to all four wheels. 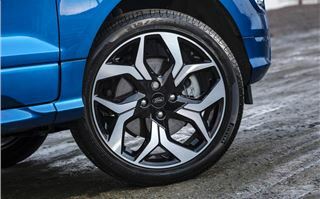 So which wheel gets what amount of power and when will still be decided by the car. A bit like Herbie, but nowhere near as much fun. 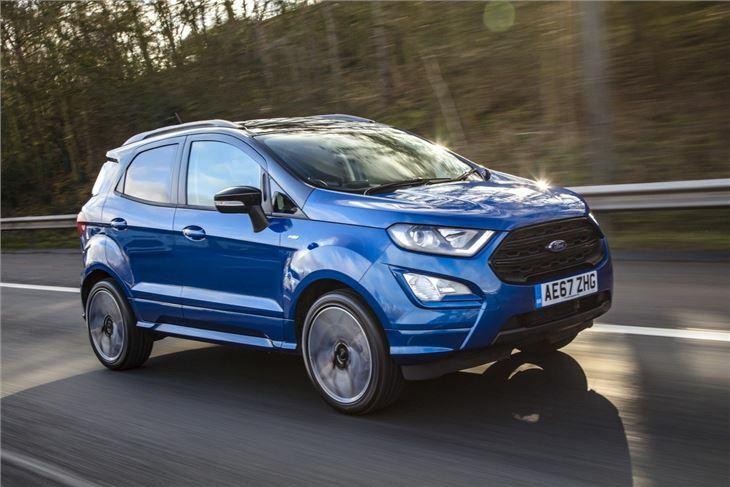 But all-wheel drive (or AWD if you’re feeling shouty and excitable) should improve the driving experience for more enthusiastic owners – although the EcoSport is far from a willing performer here. 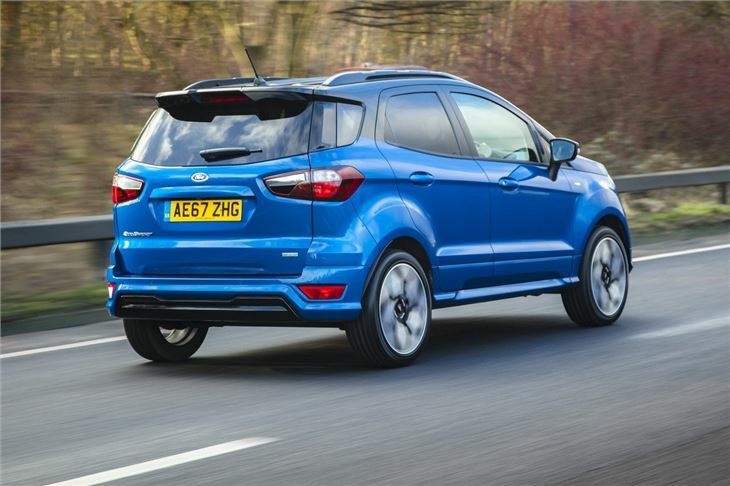 Happiest buzzing around town or stretching its legs on a long motorway cruise, the EcoSport is not a performance vehicle. For demanding drivers, there is a new trim level available – ST-line. 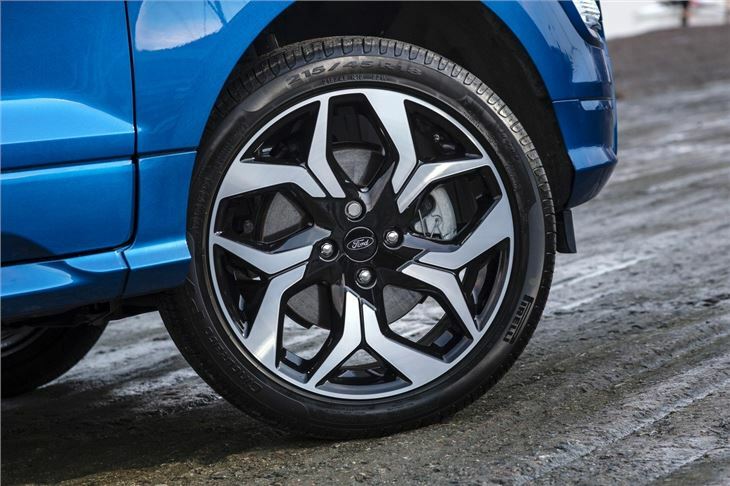 This gets you more colours to choose from, bigger alloy wheels, a body kit and a sports suspension… exactly what the EcoSport doesn’t need. The ride has always been harsh and jittery and, to give Ford credit, they’ve taken some steps to address that. But giving an EcoSport a firmer ride, bigger wheels and what feels like more sensitive steering makes driving a stressful experience. 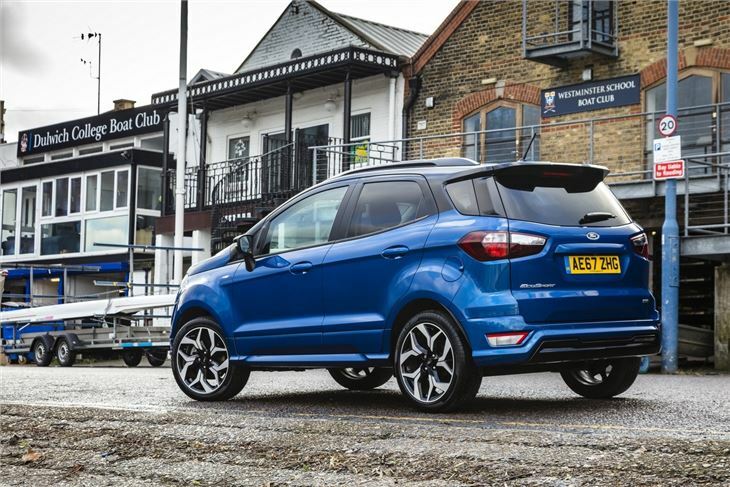 We hear dealers are positive about the ST-line model, though – it looks good and is packed with kit. But when it comes to driving, the standard suspension in the mid-level Titanium trim would be our choice. And that’s about it. If you need a miniature go-anywhere model with four-wheel drive, this isn’t it. If you like Fords and will miss your B-MAX or lament the demise of the Fusion, then you’ll probably like this. If you like Fords and fancy something small and don’t need a huge amount of space then just buy a new Fiesta. 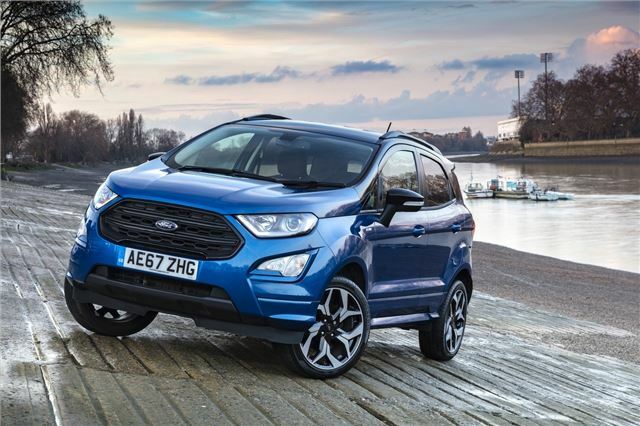 The revised EcoSport is on sale now.